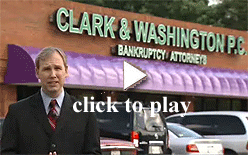 Clark & Washington bankruptcy lawyers can counsel you about your bankruptcy options. Perhaps because it is such a powerful tool, Congress has tightened the qualification rules for filing Chapter 7 bankruptcy, and our firm has filed hundreds of Chapter 7 cases in Chattanooga and in other Tennessee cities. Let there be no mistake - Chapter 7 relief still exists and for most people surviving on an modest income, you will most likely qualify. And if Chapter 7 does not make sense for you, we can discuss a Chapter 13 bill consolidation plan as well as non-bankruptcy alternatives. Chapter 7 bankruptcy may be the tool that empowers you to break your own cycle of debt. If you are struggling to pay your bills, call us at 423-634-1910 for a free telephone or office consultation. Bankruptcy is not always the right answer but you will not know if you do not call. Chapter 13 - Unlike many of our competitors, Clark and Washington does not charge any up front attorney’s fee. In most cases, 100% of our fee is paid through your Chapter 13 plan by the Chapter 13 trustee. Chapter 7 - There is no upfront cost to begin your Chapter 7 filing with Clark & Washington. In most cases, the attorney’s fee for Chapter 7 will be around $1,000. Because Clark & Washington is well known for bankruptcy representation in the Knoxville metro area, we often get emergency calls from potential clients who need immediate action. The days before a foreclosure always busy. Similarly, we frequently hear from anxious people who are literally driving around to avoid the repo agent, or from employees who have only a few hours to stop a wage garnishment. Financial crises sometimes occur when you least expect them. You may learn of a threatened repossession or wage garnishment at 5pm on a Friday, or a deal to stop a mortgage foreclosure may fall through on the Monday prior to a Tuesday foreclosure. Clark & Washington will be there for you at these times of need. Our offices are open late and we can schedule a weekend appointment. Call us any time at (865) 689-1777 and one of our attorneys will get back with you within a few minutes. Further, Clark & Washington attorneys can meet you near where you live. We have 4 satellite offices the knoxville area, including our main office on S. Northshore Drive, and satellite offices in Clinton, Maryville and North Knoxville. 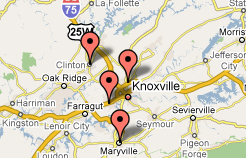 Click here to view a map showing our Knoxville area locations.